Brielle’s Coffee & Tea Room, located in Independence, Ohio, may just be one of those rare places that truly has something for everyone. Whether you come in for the specialty coffee and tea drinks, the dishes, or the relaxing atmosphere, or simply the desire to support a locally-owned, family operated business, the call to return will be there when you leave. And, when you do return, Brielle’s Coffee & Tea Room will welcome just as warmly as the first time. Brielle’s Coffee & Tea Room was opened in 1993 by Laura and Tom Giomini. At the time, Laura was working in advertising and Tom was working in hospitality, but they were ready for a change. In those days, you didn’t have big name, national chain coffee shops on every corner, so a shop that specialized in a wide range of coffee drinks and a plethora of teas you couldn’t find at any old restaurant brought something new to the community. Their Independence, Ohio community was also missing a low-key, relaxing hangout where people could take their time savoring their drinks and meals, not have to shout above the din to have a conversation, and just enjoy each other’s company. It didn’t hurt that, at the time, both Laura and Tom loved their coffee! After nearly twenty years in business, some things have changed. Brielle’s Coffee & Tea Room is still in its original location, and still provides the very best in specialty coffee and tea, along with an expansive lunch menu, and the same soothing atmosphere they have always maintained. However, competition has presented itself in the form of well known, branded chains with longer hours. Despite the branding, there is nothing in those national chain shops that you cannot find at Brielle’s Coffee & Tea Room. From variety to quality, Brielle’s is every bit as good as their competitors, right down to their made fresh to order lunches and their particularly popular mochas. Recently, Brielle’s Coffee & Tea Room has benefited from initiatives and movements that encourage consumers to patronize local businesses, and support their community, as well as the Fox 8 Cash Mob and BLUES NEO. Brielle’s Coffee & Tea Room has its regulars, and after almost twenty years in the community, they have become like family to Laura and Tom. They have had the pleasure of watching families grow and children grow up. Of course, that doesn’t mean that there’s no room for new friends, regulars, and visitors. Located only a half mile south of Rockside Road in Independence, Brielle’s Coffee & Tea Room is the perfect spot for your lunch break! Instead of trying to shoulder your way into a busy restaurant where you’ll barely have time to eat, head over to Brielle’s Coffee & Tea Room where you can actually taste your meal, and get a true break from your hectic workday with fresh food and specialty coffees and teas. 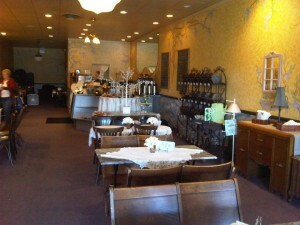 Brielle’s Coffee & Tea Room is also a great place to hold your next event. They provide private catering for groups ranging from 25 to 60. Take the pressure off of planning that bridal or baby shower, or birthday or anniversary party, and let Brielle’s take care of everything for you! To find out more about all that locally-owned, community oriented Brielle’s Coffee & Tea Room has to offer, find them online at www.BriellesCoffee.com, reach them by phone at 216.642.9292, or visit them in person on Brecksville Road in Independence, Ohio! This entry was posted in Coffee House, Restaurants and tagged Brielle's Coffee & Tea Room, locally-owned coffee shop Independence Ohio, specialty coffees & teas Independence Ohio by admin. Bookmark the permalink. The Art Gallery in Willoughby, Ohio Will Be Featuring an Exciting Art Demonstration This Month!